Our company is participating in the Caspian Ecology exhibition for the fourth time, and we hope to find partners here, because our equipment may be in demand in the petroleum, chemical and pharmaceutical industries, as well as in the agricultural sector. HAUS started its activities in Turkey in 1954; we were engaged in the repair of water pumps and presses for the production of olive oil. Currently, we are experts in the production of decantation centrifuges and separators for wastewater treatment and improving the quality of drinking water. Our equipment can be installed at oil drilling facilities in Azerbaijan (separation of the liquid fraction from impurities), plants for the production of various types of beverages and vegetable processing plants. Our range includes several types of decantation centrifuges (decanters), corresponding to innovative technologies, designed for the round-the-clock cycle of work. We are able to produce at the plant in Turkey up to 375 decanters and 150 separators per year, to provide services for the shipment and installation of this equipment. 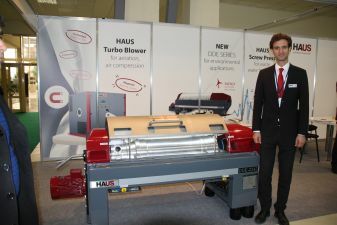 HAUS Centrifuge Technologies Co brand has been known worldwide since 2010, and we are interested in the Azerbaijani market. This exhibition is a magnificent event that opens up opportunities for the development of our business in the region and work in friendly Azerbaijan. Umayra Tagiyeva: "Use of disposable plastic..
Caspian Ecology hosts conference within 9th..